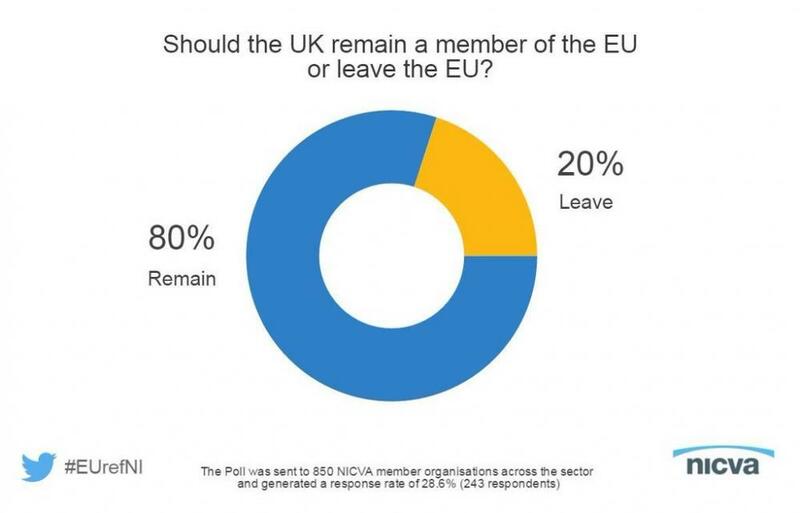 This followed the results of a survey of NICVA members who overwhelmingly favoured remaining in the European Union, 80% for remain with 20% favouring leave. Our EU Conference, also held in April, reconfirmed the support for remain in our sector with 74% of attendees preferring this option. On the economy we do not believe that the uncertainty caused by leaving the EU is in anyone’s best interests. Leaving would place the UK “at the back of the queue” in trade negotiations with other countries, to borrow US President Barack Obama’s phrase. Leaving would also give our European neighbours, particularly Germany and France, deciding say over our trading future with the European Union. Would they really offer the UK as favourable terms to trade with the EU after we have left? We can appreciate the levels of bureaucracy experienced by UK businesses dealing in the EU, we have experienced ourselves in the handling of five EU funded projects. This however is not an issue just relating to the EU, often government here add on additional layers of bureaucracy. We are also unsure that this is a good enough reason to leave. The EU showed solidarity with Northern Ireland post 1998 with the creation of the Peace Programme to support the strengthening of our civil society organisations in the early stages of the peace process. This is now seen as an example of peace-building policy to be shared throughout Europe and other regions. We believe it is in our interests to show the same solidarity with our European neighbours, supporting the building of their economies will create stronger countries with stronger economies who are better trading partners and will be places people wish to stay and indeed move to. EU Funding currently provides about 2% of the total received by the voluntary and community sector in Northern Ireland. Whilst this is obviously important to our sector it was not a deciding factor for us in supporting remain. It is also important to note our sector is not the only recipient of EU funding, current ESF funds also go to local councils and Further Education Colleges. In the last 15 years NICVA has had five projects funded by the EU, each of these highly innovative and not funded by other sources. CommunityNI was the first online hub for the voluntary and community sector which has grown to a website which received over 1.1million page views in the first three months of this year. PEACE III funded NICVA’s Vital Link project which trained people in how the Assembly works and helped get local people involved in politics. Many people argue that as the UK is a net contributor to the EU we will have more money available to invest in projects such as these. However this decision would obviously fall to the Chancellor to decide if projects such as these fitted his priorities and the first of these priorities is debt reduction. The EU has also prioritised policy issues which matter to our member organisations and the people they work with. Wider than this the EU prioritises issues as social inclusion, workers’ rights, consumer rights and environmental protection. For these key reasons, amongst others, NICVA is supporting the remain campaign in the upcoming EU referendum. However, first and foremost, we would encourage everyone to ensure they are registered to vote before the deadline on the 7th of June and to exercise this vote on the 23rd as the outcome of the vote affects all our futures.